Pure adventure on amazing trails: old shepherds’ paths and caravan routes through spectacular mountain landscapes. Experience the rolling hills of the endless high plateaus, unbelievably deep canyons, and the genuine hospitality of mountain shepherds in cottages dotting the isolated high pastures of the Dinaric Alps. 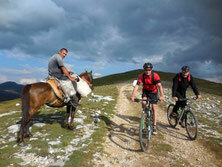 If you are not traveling with your own bike, you can explore Montenegro with our “Specialized” mountain bikes. If you value perfect organization and would like to rely on an experienced mountainbike guide, our guided mountainbike tours are perfect for you. From accommodation to food and transportation – everything is arranged. Our trained and certified guides accompany you throughout your entire trip. Guides are flexible, and can adapt the program to take into account the wishes of the group, changes due to weather conditions, and unexpected events.